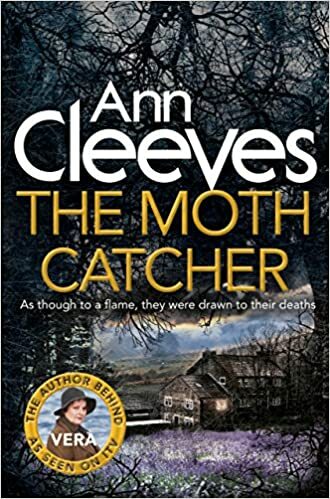 On Thursday evening I was very lucky to be able to attend a screening and Q and A of one of Ann Cleeves latest Vera Stanhope mysteries, The Moth Catcher. I was invited to the event by Islington Libraries as I’m a member of one of their reading groups (yet another benefit of library membership!). For just a £6 entry fee I got entry to a Victorian Grade II listed hotel (The Courthouse Hotel in Soho, London), a free signed copy of the book, entry to the reception, a free drink and–wait, I’m not done yet–access to the film screening and Q and A. They even threw in some popcorn just to top it off! Tremendous value, especially when you consider that a drink alone in certain parts of London might cost you the best part of that. After the reception we were treated to a private screening of episode three, The Moth Catcher, in the new series 6. I won’t say much about it here except that if you are following the series you won’t be disappointed. This is yet another atmospheric, socially insightful and gripping instalment in this very enjoyable series. Brenda Blethlyn is much smaller than Vera, and, of course, far more stylish. The Vera in Cleeves’ stories is much bigger than Brenda Blethlyn (both taller and wider). As they couldn’t make Brenda taller, they decided to make her wider by adding layers of waist-length clothing. Brenda Blethlyn said that she thinks viewers can relate to Vera because she’s ordinary, like someone you might see at the bus stop and never know that they were a high ranking detective. Indeed, this is one of my favourite things about her character. According to Ann Cleeves, the series would never have been made if it weren’t for her first Vera novel, The Crow Trap, being discovered by producer Elaine Collins in an Oxfam charity shop in North London (a huge stroke of luck for Cleeves as Collins was searching for a new story to make into a series, and a counter to the argument that having your novel sold in a charity shop is a negative experience for the author). Jamie Childs who is originally from the area, talked about what an honour it has been for him to film in the North East as this is something he’s always wanted to do. He said that he grew up in Durham in the same colliery village where Billy Elliot was filmed and used to fish in the area with his granddad. Ann Cleeves said that a knock-on effect of the show is that it has brought jobs to the North East again. There are now official Vera tours which sell in 130 countries, and tourism to the area is increasing. From what I’ve seen on the show, this looks like one of the most beautiful parts of the country and it’s somewhere I hope to visit before too long. When Ann Cleeves was asked what advice she would give her young self that she would also give to a young writer now, she said that young writers should just keep writing. She said you have no idea if any of these things will happen to you, and if they do, it has nothing to do with you and everything to do with luck. I found her advice to be both humble and inspiring, as indeed she was. I look forward to reading my beautiful signed copy of The Moth Catcher! Get your copy from Amazon: http://www.amazon.co.uk/gp/product/B00UXKJ0XA Or, your local library. Just stumbled across your blog whilst looking for a screenshot for The Moth Catcher on google images. Really glad you enjoyed the episode and the event. You should definitely pluck up the courage when you next bump into Ann, she’s a lovely lady and always has time for everyone. You’re welcome, and sorry you couldn’t be there! That would have made it even more fun, if such a thing is possible. 🙂 Strangely, I haven’t actually read any of the Vera books yet–no idea why–so I’m really looking forward to this one.